For quote sometime, we have seen people criticising Keralites as “selfish” and also as “people slightly leaning towards communal lines”! It was not something probably GOD almighty liked to happen in “God’s Own Country”. To test them, HE brought a calamity in the name of flood. I happened to be in Kochi and got associated with relief work at HMT High School relief camp for the last 5 days and I thought of sharing my experience for the public knowledge. 1. The first day, I witnessed lot of chaos as expected in any such situation with more than 500 people in a camp with almost everything in their life lost overnight! 2. In spite of excellent efforts put in by local Muncipal councilor and Camp boss, joined by me as a Mentor, things were really tough. Agitated people, a few miscreants trying to ‘fish in the troubled water’ and lot of gloomy faces around, we along with few more volunteers decided to plan what should happen and what should not happen in the next few days ahead in the camp and decided to move forward. 3. I was very clear from the beginning that this calamity is a testing from the God Almighty and we should face it with a positive mental attitude even though some people were having some reservations. 4. We decided to segregate our needs as food and non food requirements and created two stores and put lady volunteers there. Food stock has to be for 3 days and non food has to be distributed with some logics and as per needs ( which was the most toughest and challenging task). 5. We appointed committees for health& sanitation, Govt.related matters, counselling the people in distress and so on. 6. I must appreciate the flow of help coming from volunteers from Info Park, CUSAT, XAVIOR Institute of Management and several religious and social organisations at this point. 7. In spite of all odds, the third day we brought the camp under full control and made sure that each inmate including 26 Bengalis in the camp got their basic needs besides 3 time descent meals on time. Set of students from XIMEj to bring out the inmate children from the gloomy room atmosphere to the play ground. It started with small games and eventually ended up with a huge affair of entertainment for children and an opportunity for even parents to get out of room to see the happiness on the faces of children. 9. Today, on 20th August, 2018, I think we have a set of families, in spite of all their sufferings, at least showing little bit of happiness on their faces. It was all because of a TEAM effort and planned& coordinated work. 9. Only y’day I realised that VS Aboobacker, the Councilor and Yasser, the Camp Boss belong to Opposition and Ruling party camps while shown the real spirit of Community services without any bias or partiality. We had Sr. Deepthi, Father Santhosh from different churches, Seva Bharathi & several other Hindu organisation Volunteers along with several Muslim organisations and individuals working hand in hand along with IT professionals from Info Park, students from CUSAT and several other institutions and a lot of selfless local people working with one single aim to see some smile on the face of inmates of the camp. 10. I must acknowledge here the help we received from “Anpodu Kochi”’, Mr Mohd Haneesh, IAS, INDIAN Navy especially Lt. Yashwant, several Govt officials especially police, village office staff, Kalamasery Muncipality staff etc. local MLA & MP and all political parties and social organisations for all their support to make our camp a ‘Model Camp’. 11. On the coming days, we plan to celebrate Eid on 22nd and Onam on 24th with lot of programs. 12. Our biggest challenge today is the return of the inmates to their houses which are all been damaged! We are planning to extend all possible help to them to get maximum aid from Govt. to rebuild a new life. We are confident that together we can achieve that also. 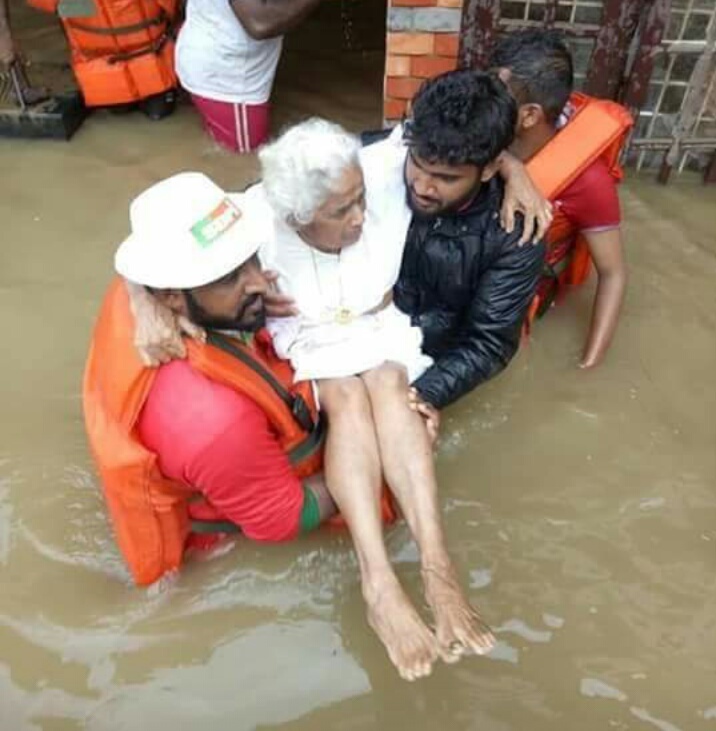 Kerala shall again show this as a “Kerala Model” of rebuilding a state in acute distress condition. It needs several crores of rupees while Keralites possibly with the changed mind set of togetherness again along with internal& external help can overcome this Challenge too. I am sure NRI Community shall pay an important role in it. If anybody wants to help these people in distress, please contact the Govt. or many genuine NGOs or even me who runs a small charity NGO focusing on specific area of these 500+ people in distress in our camp. Chairman,Manappat Group of Companies(www.manappat.com) & Chairman, Manappat Foundation. Mob: +91 98466 22222 or +97156 1717620.